Central to “ambient intelligence”; insights into the wireless sensors market for environmental and agricultural monitoring are detailed in this report. This report refers to environmental and agricultural monitoring as areas deployed with intelligent sensor interface that tracks, informs about, provides granular control of, and monitors the environment and agriculture in situ- real time. “Wireless Sensors Market for Environmental and Agricultural Monitoring” research report segments the market on the basis of products, applications and geographies. The product market is classified into physical sensors, mechanical sensors, and chemical sensors on the basis of parameters detected and measured by sensors. Acoustic sensors, flow sensors, humidity sensors, pressure sensors, and temperature sensors are classified as physical sensors. Proximity sensors, position sensors, level sensors and motion sensors are segmented under the mechanical sensors. Chemical sensors profile biosensors and gas sensors. On the basis of application; environmental monitoring includes forest fire detection; flood detection; water management; and ambient air and greenhouse gas emissions monitoring. Agricultural monitoring is segmented into crop growth monitoring; soil monitoring; pest and disease detection; precision irrigation and water management; and vehicular movement and management. The report covers North America, Europe, APAC and ROW on the basis of geography. 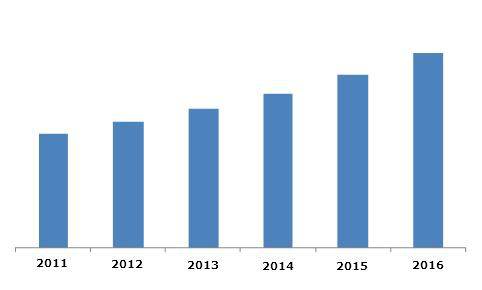 Global Wireless Sensors Market for Environmental and Agricultural Monitoring (2011-2016) report, as the name suggests, illustrates the global scenario of wireless sensors for environmental and agricultural monitoring over the next five years with insights into the three main functions of a sensor within a system- Monitoring & Control, Security & Warning, and Diagnosis & Analysis. The report also captures the market roadmap with market sizes, trend lines, revenue forecasts, market & product trends, socio-economic trends and regulations, competitive landscape. American Sensor Technologies, Inc., (U.S.), ASM Automation Sensornik Messtechnik GMBH, (Germany), Automata, Inc., (U.S.), Avir Sensors, (U.S.), BioForce Nanosciences Holdings, Inc., (U.S.), Coastal Environmental Systems, Inc., (U.S.), E.S.I. Environmental Sensors Inc., (Canada), Measurement Specialties Inc., (U.S.), MEMSIC Inc., (U.S.), Meridian Environmental Technology, Inc., (U.S.), STMicroelectronics N.V., (Switzerland), Sutron Corporation, (U.S.), The Toro Company, (U.S.), Vaisala Oyj, (Finland), and YSI Incorporated, (U.S.) are a few of the players profiled in this report with their key developments, financial details and strategies. We provide 10% customization. Normally it is seen that clients do not find specific market intelligence that they are looking for. Our customization will ensure that they necessarily get the market intelligence they are looking for and we get a loyal customer. The wireless sensors market for environmental and agricultural monitoring report elaborates the market dynamics for wireless sensors for environmental and agricultural monitoring in areas like management of greenhouse gases emission, leaching of nutrients and pesticides from agriculture productions, disaster detection and monitoring, water quality monitoring and ambient air monitoring. The market for wireless sensors for environmental and agricultural monitoring is expected to reach $2946 million by 2016 at an estimated CAGR of 11.2% from 2011 to 2016. Physical sensors are relatively mature holding the largest share with 40%, chemical and mechanical sensors follow second and third, with a share of 37% and 22% respectively. The global wireless physical sensors market for environmental and agricultural monitoring is estimated to grow at an estimated CAGR of 10.3%from 2011 to 2016. Under this segmentation flow, temperature, and pressure sensors hold the largest market share as on 2011. Humidity and acoustic sensors hold the least share in 2011. Segmented into proximity, position, level, and motion sensors; the global wireless mechanical sensors market for environmental and agricultural monitoring is estimated to grow at an estimated CAGR of 12.2%from 2011 to 2016. With gas sensors and biosensors constituting the wireless chemical sensor market; the total market for environmental and agricultural monitoring is estimated to grow at CAGR of 12.0% from 2011 to 2016. American Sensor Technologies, Inc., (U.S.), ASM Automation Sensornik Messtechnik GMBH, (Germany), Automata, Inc., (U.S.), Avir Sensors, (U.S.), BioForce Nanosciences Holdings, Inc., (U.S.), Coastal Environmental Systems, Inc., (U.S.), E.S.I. Environmental Sensors Inc., (Canada), Measurement Specialties Inc., (U.S.), MEMSIC Inc., (U.S.), Meridian Environmental Technology, Inc., (U.S.), STMicroelectronics N.V., (Switzerland), Sutron Corporation, (U.S.), The Toro Company, (U.S.), Vaisala Oyj, (Finland), and YSI Incorporated, (U.S.) are some of the companies profiled in this report. 8.1 AMERICAN SENSOR TECHNOLOGIES INC.
8.5 BIOFORCE NANOSCIENCES HOLDINGS INC.
8.6 COASTAL ENVIRONMENTAL SYSTEMS INC.
8.7 E.S.I. ENVIRONMENTAL SENSORS INC.